Over 50,000 fast food restaurants on a Google Map. Including McDonald's, Wendy's, Burger King, Jack in the Box, Pizza Hut, Taco Bell, KFC, Carl's Jr., Hardee's, and In-N-Out. I started this project in January, 2005 because I was trying to imagine the geographic distribution of fast food locations in the United States. Phil Dhingra and I spent an afternoon hacking something together. The address data was scraped off of Jack in the Box's website and geocoded by scraping from Microsoft's Terraserver. 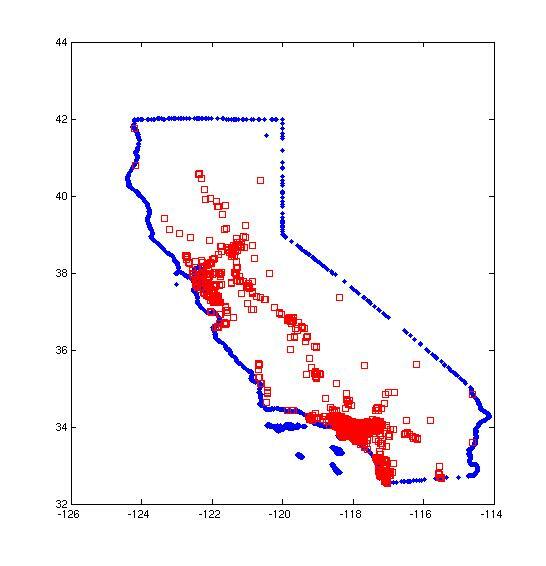 First result: a Matlab plot showing all Jack in the Box locations in California. 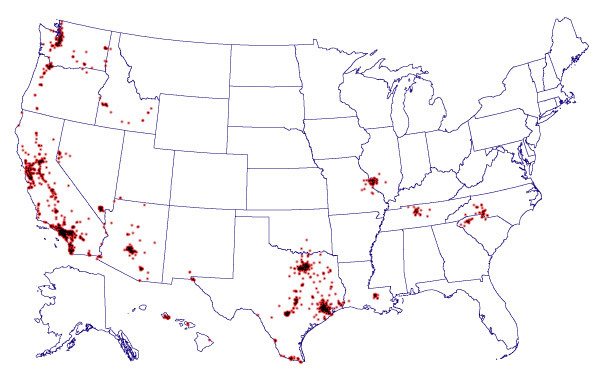 2,057 Jack in the Box locations in the United States. More static maps. 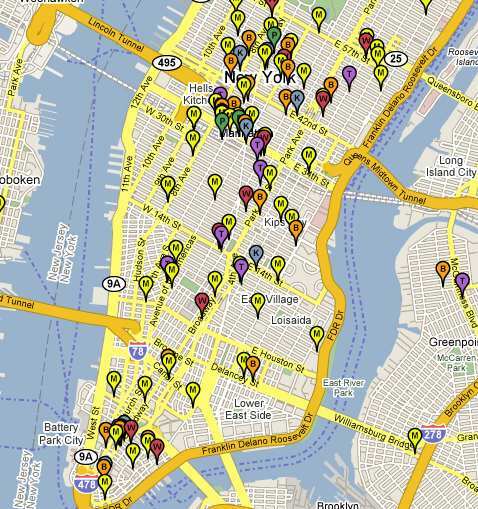 This map shows over a hundred fast food locations in New York City. As I built the site, I found an interesting use-case for it. By going to an area I'm familiar with, I'm able to use the locations of its fast food restaurants to establish context with the map. Maps are a basic form of visualization, intended to portray the lay of the land. But it can be difficult to look at a map, a simplified overhead rendering, and connect it to the scenes one has observed in real life. Pictured about is part of El Camino Real, a highway that connects San Francisco to Silicon Valley. 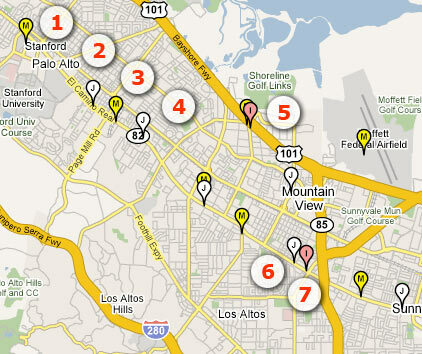 The numbered restaurants are locations that played some role in my life in the Bay Area. 1) The McDonalds in the Stanford Shopping Center. We biked here at least five times when I was a freshman. It was a fifteen minute ride from our dorm. 2) The 'Stanford' Jack in the Box. I biked here with friends about twenty times when we were freshmen, sometimes at 2:00 AM when there was no choice but to walk through the drive-in to get food. 3) The McDonalds near Fish Market. We biked here a few times before realizing the mall location was closer. 4) The 2nd closest Jack in the Box. This was across the street from a popular Palo Alto liquor store. I had a few memorable breakfasts here after pulling all-nighters. 5) Rengstorff In 'N Out Burger. This restaurant was a privilege reserved for students with access to a car. I ended up here on about twenty occasions throughout my seven years in the Bay Area. 6) When I lived in Mountain View and worked as a freelancer, this Jack in the Box was .2 miles from my apartment. 7) El Camino In 'n Out Burger. This restaurant was near my apartment as well. I walked here a number of times with Gabe Rosen, an avid exponent of the In 'N Out lifestyle. Scraping refers to a process by which text is pulled out of the code of a website and then reformatted to produce structured information. Modern websites, for the most part, are generated dynamically. Dynamic pages are not fixed documents, but are generated on-the-fly according to the contents of databases and other information. For simplicity, one can think of a database as a highly versatile spreadsheet. Jack in the Box has a database that contains all the addresses of their restaurants and they use this database to produce search results for their restaurant locater page. Scraping is a means of recovering a database which is otherwise hidden underneath a website. From the original view of the US map, it may appear the the site only contains data about major cities. But if the user zooms in enough, eventually all other cities will appear.